He married Emma Jane Smith in 1851 and together they had four children. He is the great-grandfather of U.S. Representative Thomas W. L. Ashley and a number of other descendants, including James Ashley IV, a portraitist living in Chicago. In 1848, the burly six-foot tall youth settled in Portsmouth, Ohio, where he became a journalist—first at the Portsmouth Dispatch and later editor of the Portsmouth Democrat. The following year, 1849, he was admitted to the Ohio Bar but did not practice. Instead, by 1851, abolitionist activities caused Ashley and his wife to flee north to Toledo, Ohio to avoid prosecution under the Fugitive Slave Act of 1850. There, Ashley opened a drug store (which was soon burned down) and also became involved in the new Republican Party, campaigning for its presidential candidate John C. Fremont and congressman Richard Mott. James Ashley was an active abolitionist who traveled with John Brown's wife to Brown's execution in December, 1859, and reported the event in the still-extant local newspaper, the Toledo Blade. In 1858, he led the Ohio Republican Party. As the year ended, Ashley was elected to U.S. House of Representatives of the 36th United States Congress, and took office the following year. During the American Civil War, Ashley took an active role in supporting the recruitment of troops for the Union Army. He also became a leader among the Radical Republicans, writing a bill to abolish slavery in the District of Columbia in 1862. In 1863 he introduced the first bill which ultimately (with Ashley as House Majority floor manager) became the Thirteenth Amendment to the United States Constitution by a 2/3 margin of 2 votes on January 31, 1865, formally abolishing slavery. 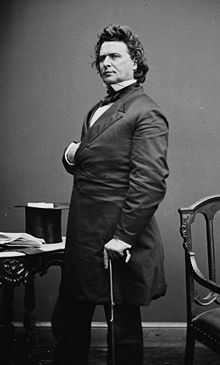 Ashley suspected President Andrew Johnson of complicity in President Lincoln's assassination, and criticized the successor president for attempting to veto extensions of the Freedmen's Bureau, the Civil Rights Bill and the Reconstruction Acts. He suspected Johnson's ties with southern oligarchs. In January 1867, Ashley initiated impeachment proceedings against Johnson, and the following February the House formally charged Johnson with "usurpation of power and violation of law by corruptly using the appointing, pardoning, and veto powers, by disposing corruptly of the property of the United States, and by interfering in elections." However, Johnson was acquitted by the Senate in May 1868. Ashley suffered from diabetes since at least 1863. He died of heart failure after a fishing trip on September 16, 1896, in Alma, Michigan (known for its sanitoriums), and was interred in Woodlawn Cemetery (Toledo, Ohio). A eulogy at the Unitarian Church in Ann Arbor, Michigan mentioned his large size, "intellectually, physically and morally. There was nothing petty, small or mean about him." Three years before his death, his efforts on behalf of racial equality were recognized by the Afro-American League of Tennessee, and he donated the proceeds of a book of his speeches to build schools. His great-great grandson Thomas William Ludlow Ashley, was later elected a U.S. Representative from Ohio. Ann Arbor, Michigan named a street leading to its railroad depot after Ashley. His descendant James Ashley IV recently completed a portrait of his great-grandfather, which is installed in the LaValley Law Library at the University of Toledo College of Law. In early 2010, the Ohio Historical Society proposed Ashley as a finalist in a statewide vote for inclusion in Statuary Hall at the United States Capitol. Ashley is played by actor David Costabile in the 2012 Steven Spielberg movie Lincoln. ^ a b c Ohio History Central. ^ a b Richards, p. 4. ^ a b c d Ingram. ^ Biography, p. Early Life. ^ Biography, p. Political Career. ^ Biography, p. Personal Life. Ohio History Central. "James Ashley". Ohio History Central. Richards, Leonard L. (2015). Who Freed the Slaves? : The Fight over the Thirteenth Amendment. ISBN 978-0226178202. Ingram, Raelin. "The Life and Times of James M. Ashley" (PDF). Cincinnati Civil War Round Table. Biography.com. "James Mitchell Ashley". biography.com. Zietlow, Rebecca E. (November 2012). "James Ashley's Thirteenth Amendment". Columbia Law Review. Columbia Law School. 112 (7): 1697–1731. JSTOR 41708162. Archived from the original on 2015-11-17. Pdf. Horowitz, Robert F. (1979). "Great Impeacher: A Political Biography of James M. Ashley". New York: Brooklyn College Press. Wikimedia Commons has media related to James Mitchell Ashley. United States Congress. "James Mitchell Ashley (id: A000314)". Biographical Directory of the United States Congress.